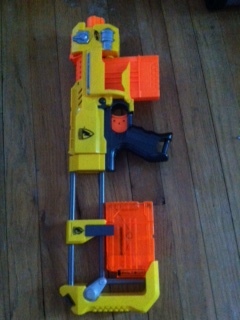 One of my many Nerf blasters is the Barricade. It has a 10 dart drum and special black tip whistle darts. It is a motorized blaster that shoots really good. But my problem is that I only have 10 of those darts. I need some way to convert it to the normal darts. 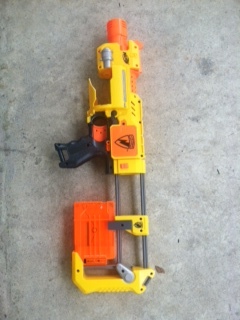 But I don’t have all of the high tech equipment like those extreme Nerf Modders. 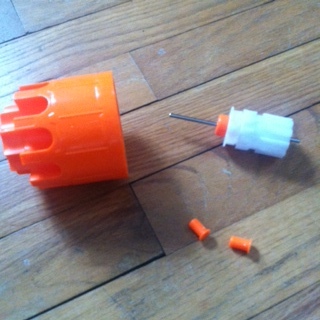 Here is a way to convert a Barrricade, to a standard dart shooter. The reason why this is my favorite is because you don’t need any other blasters except for the last part which is optional. To start, you will want to gather materials. I use a dremel multipro, but any other cutting tool that works with plastic will do. 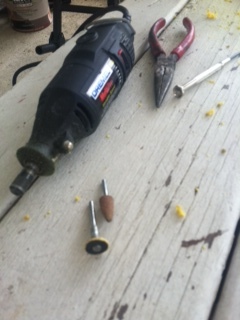 If you are using a dremel, use the cutting wheel and grinding cone. 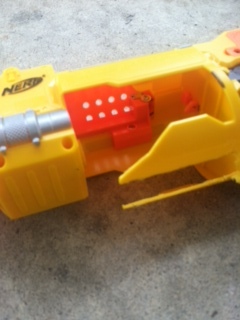 Use pliers and a phillips head screw driver to take the blaster apart. You don’t need the clamps but it helps when you are cutting near something important. Next, unscrew all of the outside screws. You don’t need the on/off switch screw, but behind the batteries, is another screw. Keep track of the two smaller screw on the front of the rail. After that, pull out the drum. It helps if you pull the trigger, and then take it out. Make sure you have all the pieces in the picture below. When you are done, the put together gun should look like this. Now comes the fun part. 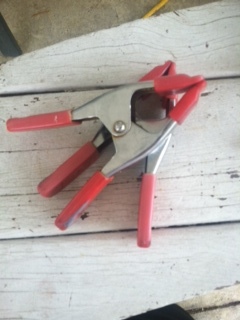 Get your safety goggles and cutting tool because we are going to cut a slot in the bottom of the gun. I highly recommend going outside so the plastic doesn’t get every where. This part can be dangerous, so only do this with proper supervision. Don’t do anything foolish, to hurt yourself, others or the blaster. Hold up a magazine and mark off a general spot. Cut the plastic out and keep trying to fit the clip in. Don’t cut off too much at the beggining because it can’t be put back on. Once it’s cut, it will look like this. Go ahead, load up a full clip, and fire. It jams. 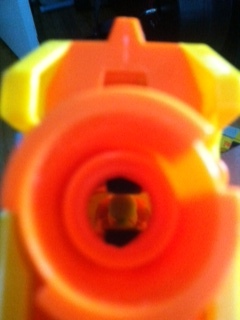 Open up the blaster again. You should see a tiny shiny screw below the access door. Unscrew that. Towards the front of the gun is a big orange box. Unscrew the top two screws and four screws on the other side. Take off the top half. It will take some force but it will come off. You will two white wheel. These push the darts, but can only grip the special darts. Take a long strip of electrical tape and cut it in half longways. Wrap both wheels with the tape. Now, find where the tape rubs against the blaster. Cut those pieces off. Put the gun together and fire away! If you would like to see other Barricade mods, comment below. Thank you for reading. If you haven’t already, like, comment, and subscribe. See you next time!